Dennis Kelly’s new three-hour play can’t be faulted for ambition: it’s a post-apocalyptic hybrid of Richard III and King Lear in which boardroom politics have taken on the dimension of bloody territorial conflict. Jonathan Slinger, last seen on stage playing Richard III, virtually reprises that RSC performance as a psychotic, newly-appointed joint CEO of a vast company who instantly adopts the uncompromising business tactics of company owner Colm to stage a takeover and declare war on his business partner. As war rages across England, a rapidly weakening Colm seeks refuge in the home of Barbara, daughter of an associate he once wronged. Blood and madness spill across the stage before Maria Aberg’s production abruptly changes tack and Colm and Barbara forage for survival in a blasted landscape. Kelly’s play shares the pitiless vision of King Lear with its unflinching look at the amorality of civil war. He is also on to something in suggesting ruthless corporate practices resemble warfare. Yet his writing is pure shock and awe. Slinger is fabulously watchable but his Richard is merely a bundle of maniacal ties, while the redemptive subplot involving Colm’s turncoat son tests the limits of plausibility. 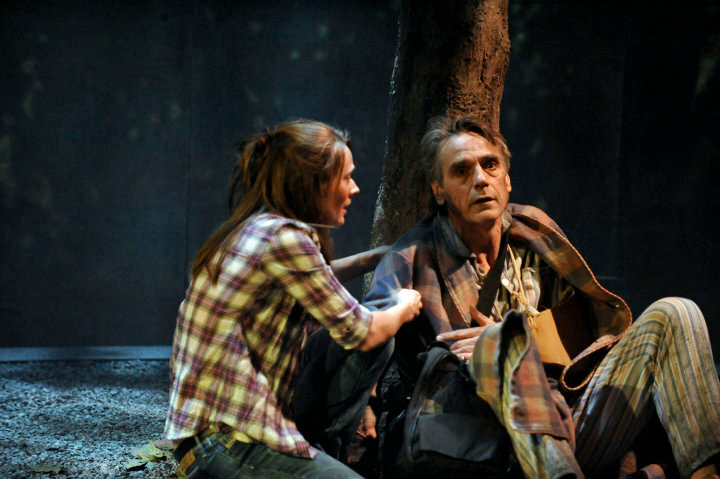 Jeremy Irons (pictured with Joanna Horton) grows into Colm, but the scope of this play outruns Kelly’s ability to explore it. Hannah Berry has been a loyal fan of Dennis Kelly’s compelling works. 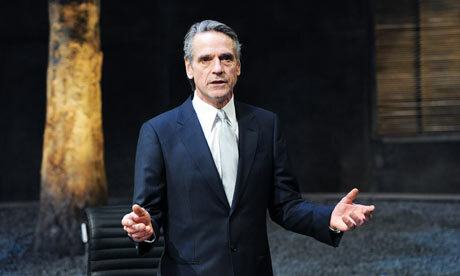 But were those high expectations realised with his new play The Gods Weep? I remember the first time I heard an extract from a Dennis Kelly play – my ears pricked up and an interest was aroused in me as if I was a shark smelling blood from two miles off. His writing is real and compelling – it takes the ordinary and shows it’s dark side. So, going to see the RSC’s production of The God Weeps at The Hampstead Theatre, my expectations were understandably high. A little longer in length and maybe slightly more surreal than his normal style, this performance was phenomenal from the opening line. A fairly large cast of fifteen and with each bringing their own strengths, it is hard to pick out one that particularly stood out. Of course Jeremy Irons was brilliant as the God-like man Colm; Nikki Amuka-Bird was a fantastically twisted and tortured Beth and Joanna Horton is a wonderfully innocent Barbara, struggling with an internal battle of mixed feelings of hate and perhaps pity, or possibly love. However, Jonathan Slinger as the sickeningly power-obsessed Richard portrays well how far some people are prepared to go and at what cost it entails. Naomi Dawson must be applauded for set designed so well, that it could so easily be switched from outside to in, bedroom to boardroom, with effortless ease. Director, Maria Aberg, used every bit of space she could, and not one orifice of the auditorium was left untouched. As an audience, you could not see what or who would come next, and from where they might spring. If you can do anything between now and April 3rd, sell your soul if you have to, but whatever you do just make sure you get a ticket. The God Weeps did not only fulfill my expectations, it went far beyond them.